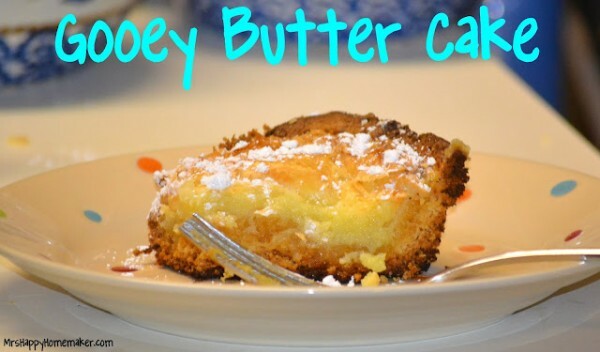 Mix cake mix, melted butter, 1 teaspoon vanilla, & 2 eggs together. Pat into a greased 9x13 baker. Beat cream cheese, 2 eggs, & 2 teaspoons vanilla extract together until smooth & creamy. Spread on top of cake batter crust. Bake for 40 minutes. Let cool for 5 minutes on a wire rack. Sprinkle with powdered sugar. Cake will sink a little as it cools.